License plates on Amish buggies? Indiana is the only state that requires license plates on Amish buggies, though it varies by county. From a lecture on the Amish by Goshen College professor Steven Nolt; photo by Cindy Seigle. Read more on Indiana Amish. 11 responses to License plates on Amish buggies? Here in Pennsylvania,(where our elected officials are always looking for new and innovative ways to increase revenue), I’m kind of surprised license plates for buggies hasn’t been implemented. I think most Amish would readily pay the vehicle registration fee if required, though I don’t think having to display the plate on their buggies would sit well with very many of them. Bill it does seem like an untapped source of income, and I’ve always sort of wondered why only Indiana of all the states with horse-and-buggy populations requires it. I’m suprised that all states wouldn’t require it. They are all money hungry for something one way or another!!! I would assume the cost to implement that program would far outweigh the benefit. If they plate a buggy, they should plate a bicycle. At one time Ohio required license plates on buggies, I know since I have a couple of Ohio buggy plates. Shortly after the plates were issued they no longer required the plates. As a follow up to my previous comment, the Ohio plates are small: 2″ x 4″ when compared to the PA plates. Though in 1974 the Pensylvania plate size was 4″ x 10″, currently 6″ x 12″, same size as on cars. I support license plates for buggies to notify next of kin in the event of a fatal accident. George thanks for the background on buggy plates in other states, was not aware of that. Currently Indiana is the only state that has buggy plates, I erroneously stated PA had plates as well, the other State was Ohio. 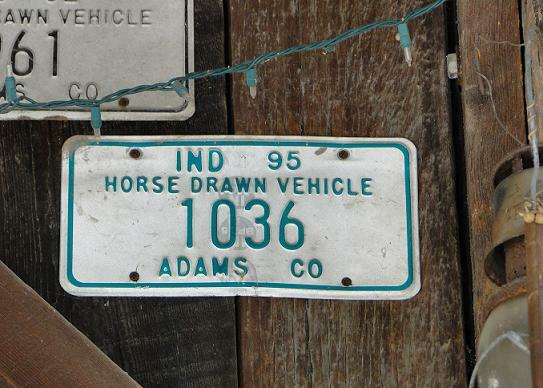 Anyone interested in what the various buggy plates from Inadiana look like, go to ebay and type: amish license plates. I collect license plates from cars, but since I like the Amish a lot I also bought Amish plates. For some reason I like the red painted Amish plates. Of course they should license buggies and their wagons as well….they use the roads and bridges they should help in paying for that use….everyone else does…. Leave a reply to License plates on Amish buggies?